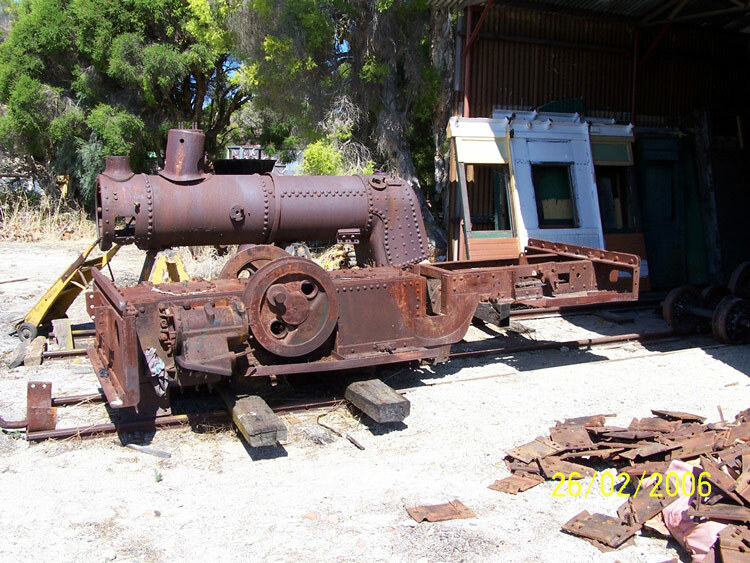 My thanks to Russell Dunn for this photo showing Krauss 2181 dismantled for static restoration on 26 February 2006. The locomotive frames have been placed are upside-down to provide access to the wheelsets and well-tank, while the boiler sits behind. This 0-4-0WT locomotive was constructed by Lokomotivfabrik Krauss & Co in Munich, Germany as their builder's number 2181 of 1889 as one of six (builder's numbers 2178, 2179, 2180, 2181, 2195 & 2196) imported in 1892 by John Robb for construction work on the Victoria Dock in Melbourne. Krauss 2181worked on a number of Robb's projects before ending up with the East Murchison United Gold Mines Pty Ltd who were located at what is now called Leinster, Western Australia. The East Murchison United Gold Mines Pty Ltd sold her to Western Machinery Co of Kalgoorlie in 1919, who kept the locomotive (presumably in work) until 1963 when it was acquired for preservation by machinery collector Lou Whiteman. The Bennett Brook Railway website includes a full history and restoration updates for Krauss 2181. In comparison with the above photo, it is apparent from the Bennett Brook Railway website updates that significant progress has since been made with the static restoration of this locomotive. a Information provided by Russell Dunn via email dated 27 February 2006. Light Railways - Australia's Magazine of Industrial & Narrow Gauge Railways', Number 153, June 2000. Article "Krauss Locomotives in Australia - A close look at their characteristics and an overview of their migrations" by Bruce Macdonald. Published by Light Railway Research Society of Australia Inc. pp.10-18.